Leaked documents rip the lid off war! growing threat of the Taliban! tens of thousands of classified documents. Was it treason – or patriotism? The controversy over the secrets of war! documents should have been published? Whistleblower website WikiLeaks has published what it says are about 76,000 United States military and diplomatic reports about Afghanistan filed between 2004 and January of this year. The firsthand accounts are the military's own raw data on the war, including numbers killed, casualties, threat reports and the like, according to Julian Assange, the founder of WikiLeaks.org, which published the material Sunday. On Monday Assange said the leaked reports from Afghanistan appear to contain "evidence of war crimes." "This material does not leave anyone smelling like roses, especially the Taliban," he said, also implying that some U.S. troops had behaved improperly. White House National Security Adviser Gen. James Jones issued a statement Sunday calling the documents' release "irresponsible." Americans and our partners at risk and threaten our national security," the statement said. There's a whole lot of information in the documents and we're digging through them with you to get a sense of what's in them, what new information we're learning about the war in Afghanistan, and what the big takeaways are that you need to know about. America's top military commander in Afghanistan is unlikely to survive the fallout from remarks he made about colleagues in a magazine profile to be published Friday, according to a Pentagon source who has ongoing contacts with the general. 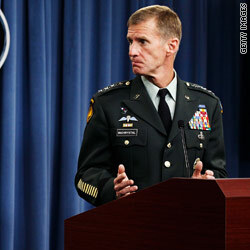 Gen. Stanley McChrystal will likely resign Wednesday, the source said. McChrystal's fate is expected to hinge on a meeting scheduled Wednesday with President Obama, who was "angry" after reading the general's remarks in Rolling Stone. The "magnitude and graveness" of McChrystal's mistake in conducting the interview for the article were "profound," White House press secretary Robert Gibbs said. Defense Secretary Robert Gates said McChrystal had "made a significant mistake and exercised poor judgment." McChrystal apologized Tuesday for the profile, in which he and his staff appear to mock top civilian officials, including the vice president. Two defense officials said the general fired a press aide over the article, set to appear in Friday's edition of Rolling Stone. "I extend my sincerest apology for this profile. It was a mistake reflecting poor judgment and should never have happened," McChrystal said in a Pentagon statement. "Throughout my career, I have lived by the principles of personal honor and professional integrity. What is reflected in this article falls far short of that standard." NOTE: We'll be discussing this tonight on LKL! Is Afghanistan worth dying for? As 31,000 more American troops last month began to trickle into Afghanistan to stabilize the country so it can stand on its own two feet, one question remains: How did Hamid Karzai come to power as the president? Does anybody remember? Has the true story ever been told? These were some of the questions I had when I received permission to sit in on an Arabic class at the military academy at West Point in late 2005. The cadets were being taught by Major Jason Amerine, whom I learned had been the team leader of Operational Detachment Alpha 574: the lone eleven-man A-team of Green Berets from Fort Campbell, Kentucky, that had met with Karzai — then a virtually unknown Pashtun statesman and aspiring guerrilla leader — in November 2001. By December 5, 2001, just three weeks after infiltrating Uruzgan Province in southern Afghanistan on Blackhawk helicopters, Karzai had been named the interim leader of Afghanistan and every single member of ODA 574 had been wounded or killed. Three weeks! This took me to a small East Coast town, where I spent a weekend sleeping in the bed of one of the men who had been killed in action. I walked the trails around the home where he’d played Army as a boy, visited his grave, and learned all about this American soldier through stories that spanned his birth to the moment his family was informed of his death. At the end of the weekend, the father admonished me to, “Tell the story like it happened. The good and the bad. That is how you can honor my son. That is how you can set the history books straight about his mission with Karzai.” After that weekend, what had been an idea became a calling. My research indicated that nobody really knew how Karzai had become president or the facts behind how this entire team of Green Berets was wiped out in the process. The war, like the news, was on to the next story and the next missions. There has been precious little time to pause and reflect, to dig deep to the roots of even these most critical missions, carried out dutifully by our armed forces. My book, The Only Thing Worth Dying For is one of the forgotten chapters from the earliest weeks of the war in Afghanistan, but it stands alone as the one mission — the most geo-politically significant victory — that still resonates the loudest in the region and around the world today. It doesn’t matter your stance on the war or Karzai. This is how it happened, as told to me by the men on the ground who were there. Eric Blehm’s book just hit the New York Times Bestseller list this week. You can learn more about the author and the book by going to: http://www.onlythingworthdyingfor.com or on Facebook. (CNN) - The moment has to happen sometime in a new administration, and the Afghanistan speech was it: the end of the Obama campaign of limitless aspiration and the acknowledgement of a presidency burdened by harsh realities and difficult choices. The candidate who had called the surge in the Iraq war "reckless" was proposing a surge of his own in Afghanistan. The candidate who criticized President George W. Bush's emergency spending bills for the Iraq war could end up proposing one of his own. The candidate who said that defined benchmarks - and penalties - were necessary for Bush's surge to work in Iraq provided none of his own in his speech. Yet, in the end, there was one consistency: The candidate who called Afghanistan a "war of necessity" found that, as president, he still believes it to be true. There was a clear subtext in the president's speech on Afghanistan: I wouldn't be in this awful situation if my predecessor hadn't sent troops to fight the wrong war in Iraq. It's awfully late in the process to jump-start this war. I tried to figure out some other way to approach this, driving my generals and the intelligence community to distraction for three months with all of my questions and scenarios. No one can actually be certain that this is going to work, given the fact that we have to depend on the previously - and notoriously - untrustworthy governments in Afghanistan and Pakistan. But, knowing the threats that are out there, we have no choice: "If I did not think that the security of the United States and the safety of the American people were at stake in Afghanistan," Obama said, "I would gladly order every single one of our troops home tomorrow." But he found out that he could not. Nor could he go the leaner troop route initially proposed by Vice President Joe Biden. We'll be on at midnight for a special in-depth look at the President's deicision to send an additional 30,000 troops to Afghanistan. He's also expected to announced a troop pullback beginning in July 2011. Tonight's EXCLUSIVE Guest: Michael Moore, who just wrote a letter to the President expressing strong opposition to the troop increase. Gen. Wesley Clark and Brigadier General Mark Kimmitt will also give us their analysis of the President's decision. That's all coming up on a special edition of Larry King Live at midnight! Do you agree with President Obama's decision to send 30,000 additional troops to Afghanistan? Note: Watch a special edition of Larry King Live at midnight! We'll talk about President Obama's decision to increase troop levels in Afghanistan with Michael Moore and others. Washington (CNN) - President Obama is sending 30,000 additional troops to Afghanistan but plans to conclude the war and withdraw most U.S. service members within three years, senior administration officials told CNN Tuesday. The expected new troop deployment would increase the total U.S. commitment to roughly 100,000 troops in Afghanistan, bolstered by about 45,000 NATO forces.